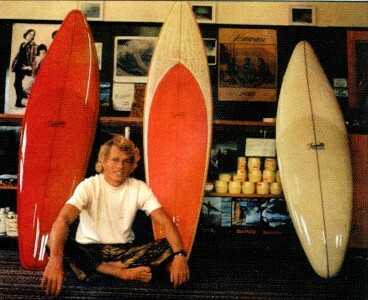 1969 Odin Side Slipper 6 ft 0"
Foam blank with resin glue line stinger, Volan glass with purple tint, resin pinlines, marble deck patch decor, fin recessed into blank. Tail damage does indicate that the fin was recessed into the foam blank, approximately 1/2 inch. 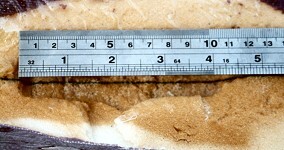 Maximun fin base length 4 inches. Fin placement also indicates the possible original tail extremity. 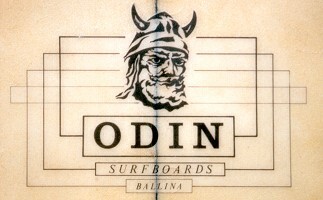 "Odin Surfboards Ballina" - black script in boxes. Sanding to remove poor quality repairs and the Plasti-bond filled tail. 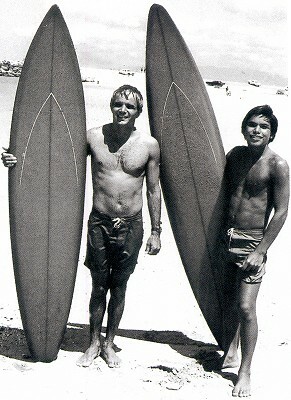 Odin Surfboards which I started up in Ballina around 1969 , after leaving Maroubra. -Rick Purnell, July 2005. Rick offered more information on Odin Surfboards and I emailed that I would complete this entry and contact him for further details. Unfortunately I have lost the email address, apologies to Rick. And From memory Peter was the driving force behind the Odin name and graphics. IMPORTANT : Not to be confused with "slipping the board " - a nose riding manoeuvre that does not disengage the fin. 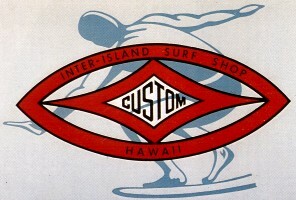 The specific design was first noted at Huntington Beach Contest, 1969 - design by Reno Abellia for Inter-Island Surfboards, Hawaii. Inter-Island Flip Tip. 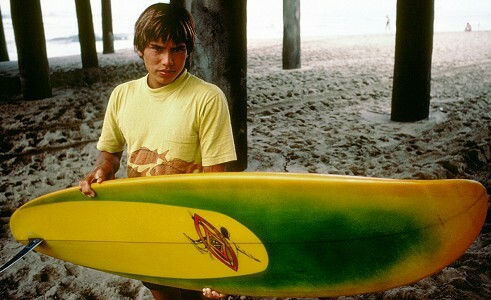 What Reno rode in '69! 16 December 2000. Not to scale.